Changes aplenty within the Australasian forest products industry this week. An Australian company, OneFortyOne plantations, is set to take on Nelson's largest forestry business, Nelson Forests and AKD, a large Australian sawmilling operation located in Colac, Victoria is looking to purchase two CHH sawmills located in Victoria and Queensland. 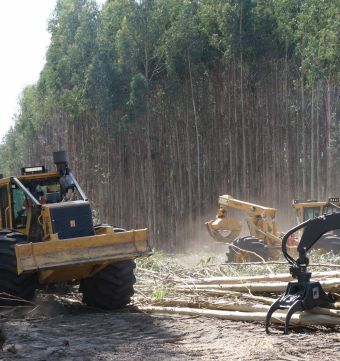 OneFortyOne Plantations (OFO) has signed an agreement to acquire Nelson Forests 60,000 ha of pine forests across Nelson and Marlborough, and the Kaituna Sawmill near Blenheim, from US-based Global Forest Partners LP. Completion of the acquisition is expected take place next year, subject to approval from the Overseas Investment Office. OFO is owned by Australian and international superannuation or pension funds. 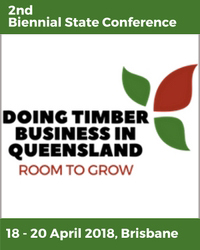 It was established in 2012 to invest in plantations and other timber operations in Australia. It acquired harvesting rights to 80,000 ha in the Green Triangle region from the Government of South Australia. AKD Softwoods (processing approx. 700,000m3 of sawlogs per annum at their Colac operations), is currently in negotiation with Carter Holt Harvey to purchase the Yarram sawmill (processing 150,000m3 of sawlogs per annum) located at Yarram, Victoria and the Caboolture sawmill processing approx. 215,000m3 of sawlogs per annum) located at Caboolture, Queensland. 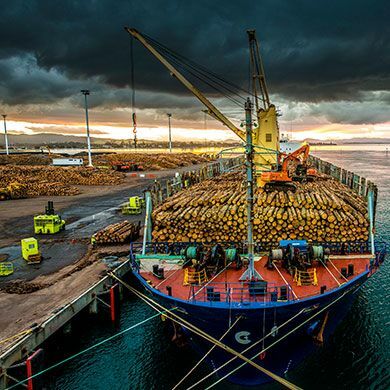 If the transaction proceeds, the company will process over 1 million m3 of sawlogs making it the second largest sawmilling company in Australia. Details relating to the downloading of presentations from the just completed ForestTECH 2017 series were sent out to all event delegates last week. In this issue we cover two stories that were part of this series; the integration of drones and training of pilots by local companies to assist in forest management and planning and we cover progress being made using virtual reality for forest cruising and inventory. Both stories in this week’s issue have also been posted onto the forest remote sensing site, www.foresttech.events being used by local inventory foresters. For the Forest Industry Engineering Association (FIEA), this last year has been particularly busy with a raft of technology events run with industry. Record turnouts of both delegates and exhibitors have been achieved. Thanks for your support. We’ve continued to provide an independent platform for profiling new and innovative technologies. The value to all those attending has also been ramped up this year with a myriad of workshops, client meetings and user group sessions that have been set up around each of the tech events. As we get closer to the summer shut-down we’ve included in this week's issue a planner for technology events scheduled for industry next year. Note, that for one of the events running early in 2018 for tech developers and some of the early adopters of new technology across the primary sector, the MobileTECH 2018, a special discounted registration rate FINISHES before you break for Christmas, on Friday 22 December. If looking to register you or your staff, best get onto it before you get caught up in the traditional end of year functions. Finally a reminder to advertisers. The last issue of Friday Offcuts for 2017 is scheduled for Friday 15 December. The first issue scheduled for next year is Friday 19 January 2018. For a bit of pre-Christmas light hearted fun, check out the music being made with Finnish harvesting machines in this week’s video clip. Enjoy this week’s read. Music from Finnish forest machines? Nelson Forests Ltd is pleased to confirm that an agreement has been reached regarding the sale of the business to OneFortyOne Plantations (OFO), a leading Australian forestry company. The transaction is subject to Overseas Investment Office (OIO) approval and is expected to close during 2018. Nelson Forests is currently 100% owned by investment funds, advised by Global Forest Partners LP, a US-based timberland investment management organisation. Nelson Forests manages 78,000ha of forest in the Nelson/Tasman and Marlborough regions and the Kaituna Sawmill near Blenheim. For local coverage of the story, click here. Carter Holt Harvey (CHH) and Associated Kiln Driers (AKD) are in advanced negotiations regarding the potential purchase of the Yarram sawmill located at Yarram, Victoria and the Caboolture sawmill located at Caboolture, Queensland by AKD. At this stage, no agreement has been reached by the parties to proceed with the proposal, and any subsequent agreement is expected to be subject to certain conditions. The Yarram mill processes approximately 150,000m3 of sawlogs and produces a range of outdoor products primarily for the Victorian market. The Caboolture mill processes approximately 215,000m3 of sawlog and produces a range of structural timber for the Queensland and Northern NSW market. All existing employees of these mills (approximately 50 at Yarram and 100 at Caboolture) will be offered on going employment. “We see these businesses as well-run operations that will be a perfect fit for the AKD Group. They provide us with a greater range of products to offer our existing customers and provide AKD with access to new markets and customers. Overall they help us become internationally competitive” said CEO Shane Vicary. If this purchase of the Yarram and Caboolture sawmills by AKD goes ahead, there will be no impact on our existing operations and employment. We believe that they will enhance our future and provide growth and stability. 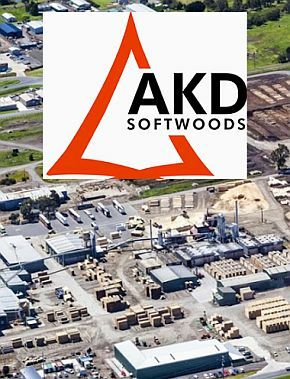 AKD currently processes 700,000m3 of sawlog at its Colac mills and has 450 employees. If this transaction goes ahead we will process over 1 million m3 of sawlog and employ over 600 staff. 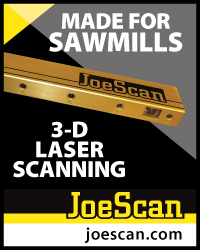 This would make us the second largest sawmilling company in Australia. Over the years we have grown our business through a combination of strategic acquisitions and capital investment in our core business. The proposed acquisition continues this approach. We believe that the future demand for quality virgin wood fibre for use in the construction of detached and multistorey residential and commercial construction is strong. The access to well managed plantations with long term supply agreements is at the core of this transaction. We are committed to providing quality locally grown and produced products, from renewable resources, having a carbon neutral or better impact on the environment. At the just completed ForestTECH 2017 series, we heard from major forestry companies in both New Zealand and Australia that are investing heavily in drones, training in-company pilots and using the technology operationally across their estates. Timberlands who manage >200,000ha plantation forests in the CNI of New Zealand including the Kaingaroa estate already have six qualified pilots (harvest manager, establishment manager, thinnings manager, fire and security manager, inventory manager and forest engineer) and are training more. Training was undertaken through Interpine and the Massey University School of Aviation. Drones or UAV’s are now in hot demand across the company with the technology being used operationally for mapping, safe behavioural observations for tree fallers, breaker outs and machine operators, windthrow assessments, survival surveys, land preparation assessments, post thinning, regeneration and waste assessments and fire. Forestry Corporation of NSW have followed a similar path. In May of this year 12 pilots along with three existing pilots were put through training so now they have 15 pilots based in 10 offices across NSW who are routinely using drones for much the same uses; plantation and native assessments, regeneration assessments and koala monitoring. Like New Zealand, the programme is being expanded and the systems for collecting and processing of the data outputs is being streamlined. 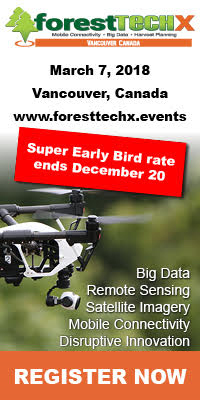 Details on how ForestTECH 2017 delegates can download the presentations with details on steps taken to introduce drones into each company and lessons on rolling out the technology were sent out last week. It appears that Swedish forestry companies are also heading down this same path as this region. Södra is Sweden’s largest forest-owner association, with more than 50,000 forest owners as its members. Södra is now investing in more forestry drones. “We have identified numerous applications where drones can enhance the efficiency of forestry work, not least when making inventories of storm-damaged forests. By purchasing equipment and investing in raising skills, we are taking another step towards the development of tomorrow’s digital forestry operations,” said Johan Malmqvist, Project Manager at Södra. Since the end of 2015, Södra has trialed the use of drones for applications including inventories of forest damage. Test outcomes have been favourable and major potential has been identified for the digital technology moving forward. 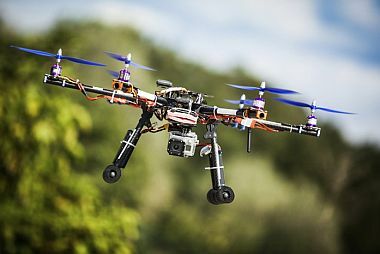 This summer, the Swedish Camera Monitoring Act was amended, which has simplified the use of drones in forestry. Södra is now taking further steps with digital development in the form of a considerable investment in drone technology and personnel skills development. “We have purchased drone equipment for all our forestry operations areas and, in the autumn, we trained 51 of our forestry professionals as drone pilots. This means we are now well equipped to further develop use of the technology,” said Johan Malmqvist. Drones are digital aids that enhance the efficiency of manual tasks for Södra’s field staff. As discussed and demonstrated at the recent ForestTECH 2017 series (photo), Virtual Reality (VR) technology may offer unique opportunities to fundamentally change forest practices for which human assessment skills are required. VR can situate users inside 3D spatial digital data acquired using terrestrial or airborne platforms with photogrammetric or LiDAR technologies. It can provide users with tools to interact with that data. An FWPA funded project is currently investigating the potential of VR in forest inventory, particular its capacity to be used for cruising operations. The visualisation of 3D spatial data in a VR environment has advantages over conventional desktop or laptop environments. VR offers the potential for field staff to perform cruising tasks within a 3D and 1:1 scaled immersive environment using their natural perceptual abilities, very similar to physically being in a location. The current research is developing an immersive environment using dense point cloud data, building software tools to import stem segmentation data extracted using other software packages, and developing tools that will allow users to extract key tree measurements such as diameter, height, sweep and branching. This research is an extension of an FWPA project, "Deployment and integration of cost-effective high resolution remotely sensed data for the Australian forest industry” (PNC326-131), with the VR work being led by Dr Winyu Chinthammit, research leader at the Human Interface Technology Laboratory (HIT Lab) Australia, School of Engineering & ICT, University of Tasmania. Forest industry input to these developments will be important. 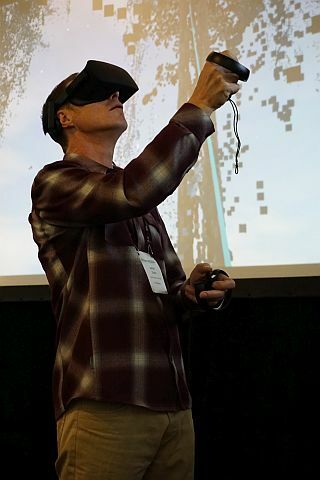 The prototype VR environment was demonstrated at the recent ForestTECH workshops in Rotorua and Melbourne and the team is working closely with leading forest inventory providers, particularly at this stage the Interpine Group, to ensure the capabilities developed have practical applications. A workshop is also being held at the HIT Lab in Launceston, Tasmania on 8-9 December 2017 to demonstrate and discuss the application of dense point clouds to inventory and to discuss future Australian and New Zealand research initiatives. Again, after an incredibly busy year, the Forest Industry Engineering Association (FIEA) has in conjunction with a wide cross section of industry on both sides of the Tasman, developed an Events Planner for next year. With again very high turnouts at all FIEA technology events that have been run this year, we’re really excited with what 2018 holds. The Events Planner will enable; forestry and wood products companies to pencil the dates into your own calendar for next year and industry associations, research organisations and those involved in setting up your own programmes for 2018 to take note of the dates (and ideally look to dovetail in to the tech events timing and location to add value to the industry and those likely to attend). 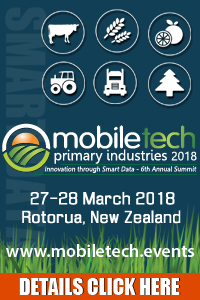 For product and service suppliers, we hope this forward planning will also enable you to schedule your involvement and to budget early on in the year to the relevant tech event and for overseas suppliers, it will enable you to lock in a time to plan visits to your key customers or distributors in Australia and New Zealand and to link in to the relevant technology events in this part of the world next year. Mark the dates into your 2018 calendars. At this early stage, if interested in either presenting or exhibiting, let us know early on and if appropriate, we can look to build you into the planned programmes. Attached for your information is a PDF of 2018 Technology Events which provides you with further information on the schedule of tech events planned for next year. The important role women play in agribusiness is being highlighted once again with four women from South Australia’s forestry industry profiled to help champion female participation and leadership in the sector. The four women join the State Government’s Women Influencing Agribusiness and Regions Strategy, which aims to grow the capacity of women in agribusiness sectors across the state by partnering with industry and the community. -	Josie Jackson, Farmer and Revegetator – runs a native tree revegetation business in the South East, manages the stock side of the family farm and organises and hosts horse schools. -	Sheryl Vickery, Harvesting Forester – manages crews contracted to harvest timber and build roads for a Mount Gambier-based forest management company. -	Wendy Fennell, Company Owner – manages and co-owns Fennell Forestry, one of the biggest timber harvest and transport companies in South Australia’s Green Triangle. -	Amy McMurren, Forestry Project Manager in PIRSA (Photo)– manages the South East Forestry Partnerships Program, which supports the development of innovative products and technologies, and is helping to co-ordinate the submission of South Australian data for the next national State of the Forests Report. -	The women from forestry join an existing group of 20 women in agribusiness and regions. -	the barriers which currently hinder women in agribusiness are understood and addressed. Be inspired by South Australia’s women in agribusiness and regions and read their profiles at www.pir.sa.gov.au/women. As shown by the results of recent poll on forestry’s role in the East Coast region of New Zealand covered in last week’s issue of Friday Offcuts, roading is a real issue of concern to the industry, to Council's and to the wider community at the moment. The need for greater co-ordination between all parties involved in the region’s ‘‘crisis’’ roading situation came out of a two-day meeting in Gisborne. It was attended by representatives from the NZ Transport Agency, Ministry for Primary Industries, Forest Owners Association, forest managers, Tairawhiti Roads and Gisborne District Council. Last Thursday they were flown and driven to Waiteata Forest inland from Tolaga Bay, to Mangatu Forest and to the Tarndale Slip. There were also presentations and talks at the Eastland Community Trust offices. Eastland Wood Council presented each representative with a copy of the report it put out in June this year entitled A Regional Economic Disaster About to Worsen — Does Anyone Care? The report outlined how underfunding for rural roads had made some unfit for heavy trucks. Others, while fit, were deteriorating rapidly. On Monday, the Australian Forest Products Association (AFPA) will build on last week’s successful delivery and promotion of two sustainably sourced real Christmas trees at Parliament House, inviting House of Representatives Members to get a photo or video with one of the trees, CEO of AFPA, Mr Ross Hampton, said. “The purpose of the real Christmas trees, which have been strategically placed on the both the Senate and House of Representatives sides of the building, is to remind our MPs and Senators of the importance of Australia’s forest industries and how they help the environment,” Mr Hampton said. “Last Monday AFPA hosted several of our elected representatives, who were either videoed or photographed near the Senate side tree to show their support. As Australians are getting ready to put their Christmas trees up across the country, everyone should seriously consider the benefits of a real Christmas tree. Not only are real Christmas trees authentic, provide a truly traditional feel and smell great, they’re also better for the environment as they’re renewable and recyclable”. 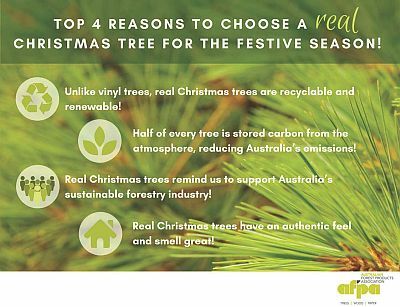 “Real Christmas trees also remind us all to support the 120,000 Australians who work across the full value chain of our sustainable forest industries right around Australia. To celebrate Finland's 100 years of independence and Finnish work, the world will now hear Finlandia, the symphonic poem composed by Jean Sibelius, being performed by forest machines. The new arrangement of the piece, called Finlandia by Forest Machines - a Tribute to Finnish Work, comes straight from the deep woods of Savonia in Finland. "Together with our customer Ponsse, we wanted to record Finlandia with forest machines as a gift to Finland on its independence day. The Tribute is also part of our campaign to support Finnish work in a concrete way. Within the campaign, we will donate fuel for job seekers to help them get to interviews and to take on short-term jobs. This is even more important now as the legislation in Finland requires that job seekers have to accept work as far as 80 kilometers from their home," says Vice President of Marketing for Marketing & Services at Neste. The campaign will run until the end of the year. The sum to be donated will increase each time when someone watches the video, up to EUR 20,000. The Finnish National Organization of the Unemployed, Työttömien keskusjärjestö ry, has joined the campaign as an official partner, and the donation will be made together with the organization in January 2018. "It is a pleasure to be part of Neste's campaign for increasing the appreciation of Finnish work and to support employment. New jobs and regional well-being benefits everyone in Finland. The campaign puts emphasis on the appreciation of work which is one of our basic values. The location of Neste's video shoot for the campaign was our home municipality Vieremä in Finland," says Juha Vidgrén, Chairman of the Board of Directors at Ponsse Oy. Partners in video production include the social media agency Kurio, the No-Office production company, and the communications agency Miltton. More than 300 video clips and nearly 1,000 audio clips were used, originating from three forest machines lubricated by Neste and fueled by Neste MY Renewable Diesel. The video was starred by professionals of the forest machinery Marko Karhu (forester), Anne Räihä (driver), Hannu Liikanen (driver), Tarmo Juntunen (driver) ja Janne Oldenburg (sound recordings). 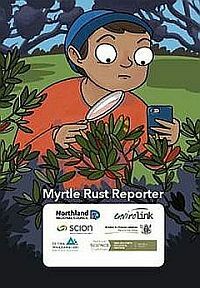 Late last week a new app ‘Myrtle Rust Reporter’ was released in the Apple and Google Play stores. It has been developed by the Northland Regional Council, Scion, Envirolink, Te Tira Whakam?taki (Maori Biosecurity Network), the Biological Heritage National Science Challenge, and MPI. It represents a major effort on the part of the BioH Challenge to help MPI with their 4.7 million biosecurity citizens initiative under Biosecurity 2025, and provides a fun but useful way for citizens to get engaged in important science observations. Myrtle rust currently is a major threat to a number of New Zealand’s native species (as it is for Australian species – see story this week), including pohutukawa, ramarama, northern and southern rata and manuka, as well as important plants in the horticulture sector, such as feijoa. This app works with NatureWatchNZ. You can find out more information on the NatureWatchNZ site, which also has links to the Apple and Google Play stores. Further details can be found on naturewatch.org.nz/projects/myrtle-rust-reporter. The Australian Industry and Skills Committee (AISC) has approved the Case for Endorsement for the updated and revised units of competency, along with a Companion Volume Implementation Guide. 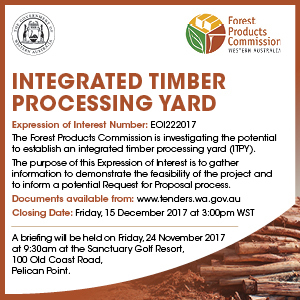 The revised units will be released on to training.gov.au by the end of 2017, contained within the FWP Forest and Wood Products Training Package. Once published on training.gov.au, the units will be available for use by registered training organisations (RTOs). Units in this project were reviewed and developed in line with current forest harvesting optimisation technology and the impact on utilisation processes. This process was led by the Forest Management and Harvesting Industry Reference Committee (IRC) and guided by an industry based Technical Advisory Committee. Northport Ltd is celebrating its 15th anniversary. Cargo volumes at Marsden Point have more than doubled since the port opened in 2002 to a record 3.64 million tonnes last financial year. Ship calls have increased from 93 a year to 250 a year over that period, with berth occupancy now at a record 66.4 percent, up from 52.9 percent just five years ago. The company, a 50/50 joint venture between Marsden Maritime Holdings Ltd and Port of Tauranga, is marking these milestones by launching a public discussion about the potential future size and shape of the Northland port. It has published its ‘vision for growth’ online at www.vision4growth.co.nz and is inviting people to ask questions or make their views known to its management team via the website. The angle-stemmed myrtle had been looking like a species saved just in time from extinction. Several hundred trees had been bred from a mere 75 survivors lingering in tattered scraps of rainforest around Logan City, just south of Brisbane. Then in 2010 a feared disease slipped past Australia’s quarantine. The new leaves that form on myrtles today are apt to sprout yellow pustules, turn black and fall off. Myrtle numbers are falling. The disease – myrtle rust – has shown what it can do in South America, its native home. Brazil has the world’s largest plantations of Australian eucalypts – more than six million hectares tended by four million workers – and problems struck in the 1970s when seedlings began dying en masse. The survivors grew into trees too deformed to harvest. Losses of up to 40 per cent in wood production were reported. The industry survived the crisis by investing heavily in breeding eucalypt varieties that resist the disease. Some of these varieties are now at risk from a newly discovered strain of myrtle rust. Australia could lose 14.8 per cent of its eucalypt timber output from this disease. That is a worst-case scenario produced in 2006 for the Primary Industries Ministerial Council, when the rust turned up in Hawaii and began killing trees there. Australia, the land of myrtles, has much to lose. Eucalypts are members of the myrtle family (Myrtaceae), Australia’s largest plant family, along with tea-trees, bottlebrushes, paperbarks, lilly pillies and others – some 2250 species altogether. Myrtle rust has been reported infecting more than 240 species, with some rainforest trees dying so quickly that scientists have voiced fears they may “become extinct in the wild within the next decade”. The rust spread dramatically inside Australia after it was found in a large nursery near Gosford, infecting hundreds of plants. How it reached Australia is not known, though the nursery trade helped it spread rapidly along the eastern seaboard, reaching Tasmania and the northern tip of Queensland by 2015. Its spores also blow on the wind and travel on honeybees. Because the strain of myrtle rust that has reached Australia is not one that blights eucalypts, one view is that the risk to Australia has been overstated. But John McDonald, biosecurity manager of the Nursery and Garden Industry of Australia, rejects any talking down of the disease as “just absolute head-in-the-sand stuff”. More >>. The New Zealand carbon price has broken through the $20 a tonne mark, as it continues its push higher on speculation the new government will lift a cap on the maximum price emitters pay. The price for a New Zealand carbon unit under the Emissions Trading Scheme last traded at $20.25 per tonne on OMF's CommTrade platform, having jumped higher after Green Party leader and climate change minister James Shaw told industry publication Carbon News last week that he believes carbon prices need to be higher than the current cap of $25 per tonne. "There is virtually zero momentum in this market for a downside move," Nigel Brunel, financial markets director at OMF in Auckland, said. "Carbon is on the move; we believe this market will be nearer $22 come February/March. The current government/Greens have clearly signalled higher ambition and a desire to see carbon prices above $25." New Zealand is reviewing its emissions trading scheme, which currently includes a $25 per tonne cap on the price emitters have to pay the government for liable emissions. Carbon prices have accelerated since Shaw told Carbon News last week that he expects to announce before Christmas the process to establish a climate commission, and that officials are about to begin work on outstanding issues from the latest review of the ETS, including the carbon price cap. Shaw told Carbon News that he believes carbon prices need to be higher than $25, although he noted the commission will have some say over those prices. The carbon price had collapsed from a high point of $21 a tonne in 2011 to trade as low as 35 cents a tonne in 2014 as cheap eastern European carbon units flooded global markets already reducing emissions due to lower industrial activity after the 2008 global financial crisis. The $25 per tonne maximum capped price for New Zealand units aimed to stop major industrial emitters facing spiking carbon prices, after rules were tightened to prevent local emitters from accessing international carbon markets, making NZUs the only carbon emission units obtainable by emitters. She responds, "Well, let's see what we can do about that: 1, you have to be single and 2, you must be Catholic." "OK," the nun says. "Pull into the next alley." The nun fulfills his fantasy with a kiss that would make you blush. But when they get back on the road, the cab driver starts crying. "Forgive me but I've sinned. I lied and I must tell you, I'm married and I'm Jewish." And on that note, enjoy your weekend. Good luck with the shopping. Cheers.